Woking have re-signed Aswad Thomas on a deal until the end of the season after the defender left fellow Conference side Grimsby Town by mutual consent. The 25-year-old made 92 appearances for the Cards between 2009 and 2011. "Aswad was doing very well at Grimsby and suddenly found himself out of favour," Woking assistant manager Steve Thompson told BBC Surrey. "He's not played loads of games this year, but he thinks he's ready to come straight in." 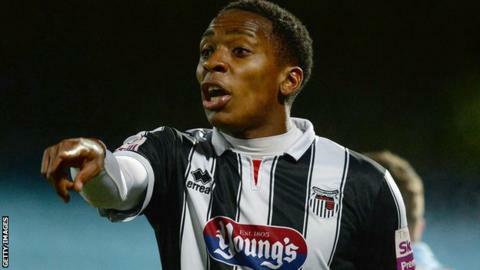 Former Charlton trainee Thomas made 14 appearances for Grimsby this season, but has not featured for the Mariners since New Year's Day. Since then he has been given leave because of stress. Thomas's first spell with Woking ended when he left for Braintree in the summer of 2011 and Thompson is pleased to have him back at Kingfield. "He did very well before when he was here. We didn't want to lose him," he said. "In the last three years he's played well over 100 Conference games and he's well liked by the players and the fans who remember him. "He's fully fit, he's an athletic lad and perhaps he just needs a change."